Chillin (also known as chillindude, formerly known as chillindude829) is an American professional smasher, who mainly plays Melee, maining Fox. 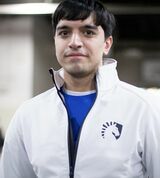 He is well known for being the first notable Fox player in competitive play, popularizing the use of several Fox techniques that are commonly used by professionals to this day. He was a prominent member of H2YL when the crew was active, and has written a notable amount about his past history and the origins of Melee in his blog, "History of a Smasher", on SmashBoards. Chillin was formerly ranked 57th on the 2017 SSBMRank and was formerly ranked 3rd on the MD/VA Melee Power Rankings. He was also formerly ranked 6th on the MD/VA Project M Power Rankings and 8th on the discontinued Smash Panel Power Rankings. Chillin has been a contender in Melee tournaments since 2002, and was the first ever player to take a set off of Ken in a singles tournament (at Game Over in early 2004). He was known for creating several Fox combos during his early career, such as using three falling up airs in a row, and waveshining across the stage along with a shine spike. During the 2003-2007 era of Melee, Chillin was a common participant in nationals, such as MLG events, being able to frequently place within the top 8 of them. In doubles, he often teamed with Azen, being the first team to defeat the team of Ken and Isai in grand finals of a tournament (at MLG Chicago 2006). During the 2008-2010 era, after Melee presence began dying out due to Brawl tournaments beginning to appear, Chillin continued to play Melee, but not at the same level that he used to. In 2011, Chillin accompanied his long time friend and doubles partner Azen in Azen's first tournament appearance in almost four years, at Pound V in February 2011, where they placed 9th in doubles. He and Azen then started a new YouTube series, "Fight Nights with Azen and Chillin," in which they would talk about fighting games and aim to share strategies and help others improve. Chillin remains a top Fox player, and is still able to place highly at various nationals. On April 11th, 2014, Chillin was picked up by Team Curse prior to their merge with Team Liquid, being the first player to be selected for their Melee team. At EVO 2014, he managed to defeat Colbol 2-1 and Westballz 2-0 in the losers' quarters pool before losing to Fly Amanita 0-2, placing 9th overall in Melee singles. Following a post on Twitter by Leffen about Team Liquid's choice of players to sponsor (Chillin, Hungrybox and Ken), Chillin challenged Leffen to a first-to-five Fox ditto on Apex 2015's Salty Suite for $100, as well as the "rights" to use Fox's default color palette in Melee tournaments. He ultimately lost to Leffen, failing to win a game in the resulting set. He finished 33rd at the tournament. Chillin still later placed well in other major tournaments in 2015, including 17th at CEO 2015 and Super Smash Con 2015, 33rd at HTC Throwdown and 17th at The Big House 5. In 2016, after a mediocre 49th placing at GENESIS 3 to start off the year, he placed 25th at Pound 2016 and CEO 2016, then later got 17th at EVO 2016 and 25th at Super Smash Con 2016. Following another 33rd placing at Shine 2016, Chillin demonstrated why he continued to be a top Fox player by placing 13th at The Big House 6 and 9th at Eclipse 2. In 2017, he managed to get a higher placing at GENESIS 4 than the previous year's iteration, placing 33rd. At DreamHack Austin 2017, he got 17th, then once again placed highly at Smash 'N' Splash 3, with 13th. On September 1st 2017, he announced on Twitter that he would take a break from competing seriously for a couple of months, focusing instead on his stream and commentary. He still enters tournaments usually using secondaries, and still competes in doubles. Chillin briefly played Brawl shortly after its release, and placed 3rd at Critical Hit 3, though has since quit, viewing Brawl as a non-competitively viable fighting game due to its removal of techniques and overly defensive gameplay, which, in his opinion, took away from the depth of the game. Chillin is also a professional Wolf player in the Brawl mod Project M. He commonly competes in Project M locals in the MD/VA area, though he has not made many impacts in singles events at national tournaments. He usually teams with ChuDat at nationals; the two have achieved decent results in doubles events. He also occasionally entered SSB4 in regional tournaments, mainly using Mega Man. DC Super Smash 2 September 20th, 2003 8th — Mild? Prior to the Salty Suite, Chillin infamously recorded a rap song that denigrated Leffen, using the Melee track Corneria to back his lyrics. It led to a number of parodies, as well as other smashers performing their own rap tracks directed at other smashers. A number of his facial expressions in the set sparked several memetic posts, including jokes about his death. After his defeat in the Salty Suite, Chillin said "My B" into a microphone at the tournament, causing other smashers to humorously utter it in tournaments and in chats. Aside from the diss track "Respect Your Elders" about Leffen, Chillin has also recorded several other diss tracks about Hugs, Mew2King, and other Melee competitors. After his loss to Leffen, Chillin began to use Fox's blue costume in tournaments. However, in October 2016, Leffen allowed him to use the default costume again. Outside of Smash, Chillin speedruns Super Mario Sunshine and Super Mario Odyssey. Chillin's "History of a Smasher"
This page was last edited on April 22, 2019, at 00:19.